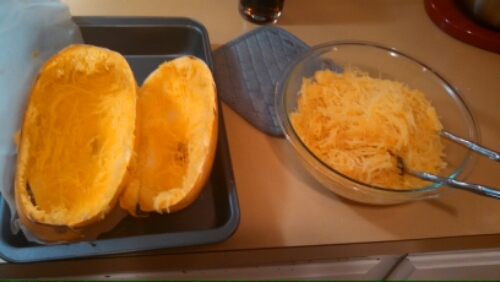 I have been meaning to try out spaghetti squash for over a year now. My friend Alysha and I were discussing it recently and it turned out she had been intending to try it also. We decided to get together last weekend to join efforts…this was actually a HUGE deal for her, as she is one of the pickiest eaters ever (by her own admission! )…and honestly, I have never been a huge fan of other squash. We were both a little nervous. We also had no idea what we were doing. I googled a lot of recipes and ways to prepare it and it seemed that roasting it was the most popular and reportedly tastiest method. 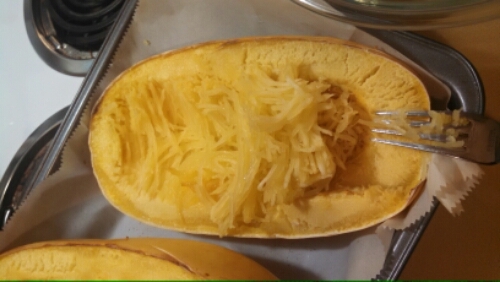 We merged this Dashing Dish microwaved spaghetti squash recipe with this Martha Stewart roasted spaghetti squash recipe, and adapted our own version from there. IT WAS SO GOOD! I think we were both a little surprised at how much we enjoyed the final product. It was a bit on the crunchy side, which I actually really liked. 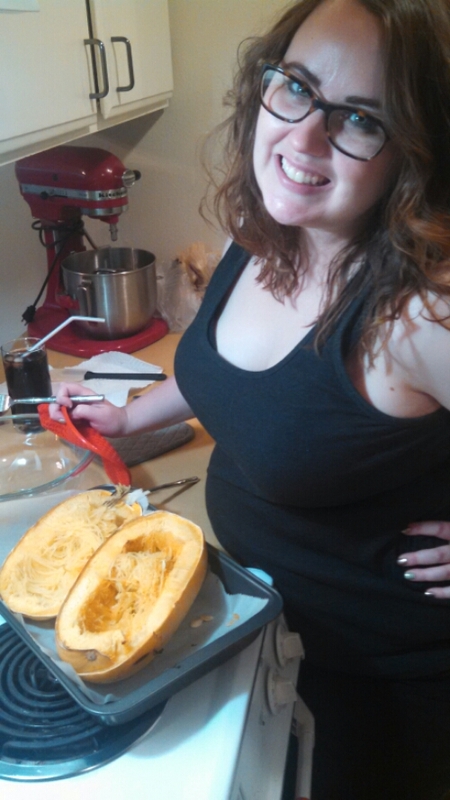 Alysha observed that the slight sweetness from the squash made the sauce a bit sweeter, also. Also: one squash will yield a TON of “spaghetti.” We each ate large portions that night, and it created about 4-6 leftover servings. It was also really fascinating how it really does look like spaghetti! 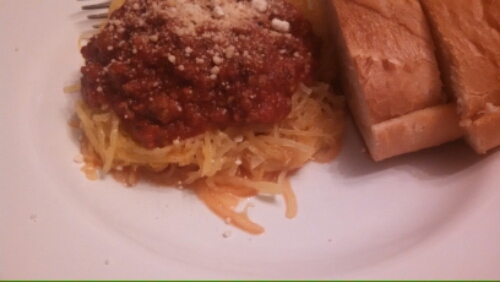 I realize it’s called “spaghetti squash” for a reason, but was still neat to see how it literally came out in spaghetti-like strands when we scraped each half with a fork. I have been told if you want to do a quicker version, you can simply nuke it for 6-10 minutes and it will be ready. The spaghetti sauce is a recipe that Alysha got from her mother-in-law and is now her and her husband’s go-to sauce – and it’s really obvious as to why. It was delicious!! -In a frying pan, brown the meat with the onion, garlic, and a dash of salt and pepper. -Once browned, drain the grease and add to the crock pot, along with the spices, tomato paste, one can of water (in the paste can), sauce, and diced tomatoes with the juice. Mix together. -Cover and cook on low for as long as you like (about 8 hours at the most). -This can be done on the stove top, as well. 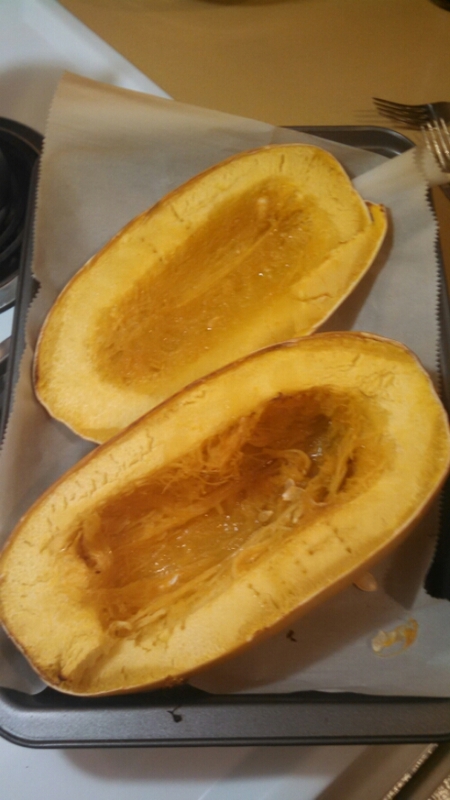 -Puncture the squash a few times with a fork or knife. -Microwave the squash for about 5-6 minutes, then cut it in half (it will be nearly impossible to cut if you don’t microwave it first). Scoop out the seeds and any gunk that you can see. -Line a baking dish with parchment paper or foil (or just put it directly on, if you prefer) and set the squash in, face up. Using a basting brush, spread some olive oil on each side, and sprinkle some garlic over it. -Roast it in the oven for about 30 minutes. It should be easily punctured with a fork. 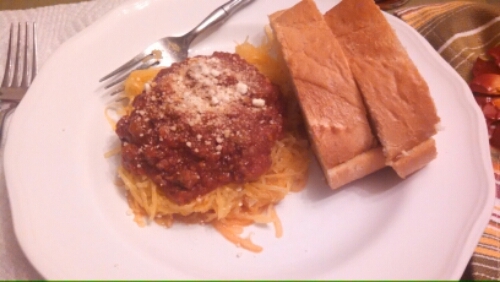 -Using a fork, scrape the insides of the squash to create spaghetti-like strands. You can keep scraping until you get down to the skin! So do you have to puncture the sqash before microwaving ? Yes, I forgot to include that, so I will edit the post – thank you for asking! According to several websites, it’s good to puncture it ahead of time.